2. Nurse Kim is caring for a client with a pneumothorax and who has had a chest tube inserted notes continuous gentle bubbling in the suction control chamber. What action is appropriate? a. Do nothing, because this is an expected finding. b. Immediately clamp the chest tube and notify the physician. c. Check for an air leak because the bubbling should be intermittent. d. Increase the suction pressure so that bubbling becomes vigorous. 3. A nurse has assisted a physician with the insertion of a chest tube. The nurse monitors the adult client and notes fluctuation of the fluid level in the water seal chamber after the tube is inserted. Based on this assessment, which action would be appropriate? b. Continue to monitor the client. c. Reinforce the occlusive dressing. d. Encourage the client to deep-breathe. b. Place the tube in a bottle of sterile water. c. Immediately replace the chest tube system. d. Place the sterile dressing over the disconnection site. c. Inhale and exhale quickly. d. Perform the Valsalva maneuver. a. Call the physician to reinsert the tube. b. Grasp the retention sutures to spread the opening. c. Call the respiratory therapy department to reinsert the tracheotomy. d. Cover the tracheostomy site with a sterile dressing to prevent infection. 7. A nurse is caring for a male client immediately after removal of the endotracheal tube. The nurse reports which of the following signs immediately if experienced by the client? 8. An emergency room nurse is assessing a female client who has sustained a blunt injury to the chest wall. Which of these signs would indicate the presence of a pneumothorax in this client? 9. A nurse is caring for a male client hospitalized with acute exacerbation of chronic obstructive pulmonary disease. Which of the following would the nurse expect to note on assessment of this client? 11. A nurse performs an admission assessment on a female client with a diagnosis of tuberculosis. The nurse reviews the results of which diagnostic test that will confirm this diagnosis? c. Strengthen the intercostal muscles. d. Promote carbon dioxide elimination. 15. Nurse Hannah is preparing to obtain a sputum specimen from a client. Which of the following nursing actions will facilitate obtaining the specimen? 16. A nurse is caring for a female client after a bronchoscope and biopsy. Which of the following signs, if noted in the client, should be reported immediately to the physicians? 18. A nurse is suctioning fluids from a female client through an endotracheal tube. During the suctioning procedure, the nurse notes on the monitor that the heart rate is decreasing. Which of the following is the appropriate nursing intervention? c. Stop the procedure and reoxygenate the client. d. Ensure that the suction is limited to 15 seconds. 20. A female client is suspected of having a pulmonary embolus. A nurse assesses the client, knowing that which of the following is a common clinical manifestation of pulmonary embolism? 21. A nurse teaches a male client about the use of a respiratory inhaler. Which action by the client indicates a need for further teaching? 22. A female client has just returned to a nursing unit following bronchoscopy. A nurse would implement which of the following nursing interventions for this client? 23. A nurse is assessing the respiratory status of a male client who has suffered a fractured rib. The nurse would expect to note which of the following? 24. A female client with chest injury has suffered flail chest. A nurse assesses the client for which most distinctive sign of flail chest? 27. A nurse is assessing a female client with multiple trauma who is at risk for developing acute respiratory distress syndrome. The nurse assesses for which earliest sign of acute respiratory distress syndrome? 29. A nurse is assessing a male client with chronic airflow limitations and notes that the client has a “barrel chest.” The nurse interprets that this client has which of the following forms of chronic airflow limitations? 30. A nurse is caring for a female client diagnosed with tuberculosis. Which assessment, if made by the nurse, is inconsistent with the usual clinical presentation of tuberculosis and may indicate the development of a concurrent problem? 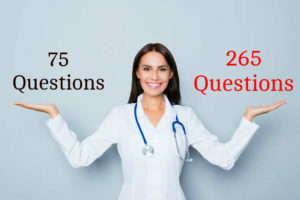 More nclex sample questions coming up.